I suppose that makes me lazy. But it gets crazy tangled and I can’t help imagine how much easier it would be to chop than to comb. Luckily my 23 years has provided me with enough of a semblance of foresight to know that immediate happiness will not compare to long term angst over boy hair. I’m not knocking short hair on ladies – I just personally can’t. Now guess the gender and age of my participants. Six and eight-year-old boys? You are correct. Materials: Paper. Pen. Markers/Crayons optional. 1) Start with a square piece of paper. 2) Fold it in half, and then open it back up. There should be a crease dividing two equal rectangles. 3) Turn it 90 degrees to the right and fold it in half, then open it again. There should now be creases marking four squares on your paper. 4) Take the tip of the top right corner and bring it to meet the center of the paper. Fold it down. (It should make a right angle 90-45-45 degree triangle. ) Repeat with the three other corners. It should now be diamond shaped (or square shaped if you turn it). 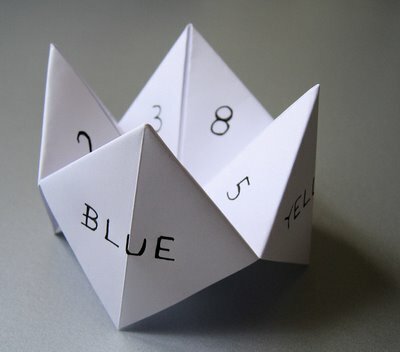 5) Flip the paper over. Take the corner tips and fold them into the middle, exactly like you did in step 4. 6) Flip the paper over again. There should be four square-shaped flaps. These are your finger flaps. Take your index finger underneath one of the flaps and wiggle it around to pop it up. Repeat with all the flaps. If this is difficult, try folding in half and opening. This should loosen it up. If you haven’t been exact in your folding, some of the squares might overlap and tear. 7) Number and color as you like. The fortunes go underneath the inside flaps. Here’s a video I found online. Wow..mine looks like a Rubik’s cube….